Bona Traffic HD is made for hardwood floor owners with an uncompromising attitude towards durability, being green and looking beautiful. It is the world's toughest and fastest drying lacquer for wooden floors exposed to extreme wear, allowing full traffic to be resumed in 12 hours. Significantly outperforms all other polyurethane topcoat finishes, including Bona Traffic, in durability at 24 hours. Bona Traffic HD is a two-component, polyurethane, waterborne varnish for the surface treatment of timber floors in commercial premises, or wherever a high resistance to wear is required. This product is also suitable for overcoating of compatible factory pre-finished timber and cork floors. Commercial and residential buildings including shopping malls, restaurants, offices, retail stores, theater stages, hospitals, schools, and nursing homes. Bona Traffic HD provides a clear, natural appearance, giving almost invisible protection when the IP (Matt) version is used. However, unlike oil, it offers a simple level of maintenance. It is Bona's most hard-wearing lacquer. Available in IP (Matt) or Silkmatt versions. Where there is a risk of sidebonding, Bona Prime Classic is recommended for the initial coat on bare wood. This product has a very good adhesion to factory pre-finished and previously lacquered floors, but the surface must be carefully cleaned and abraded prior to overcoating. Keep in mind it's not recommended to apply more than two full coats per day, due to risk of excessive wood swelling. Poor drying conditions may result in a weakened film with worsened adhesion, so you must ensure there's an unobstructed airflow during drying. • Shake the Traffic HD can and add one bottle of Traffic HD Hardener. Immediately proceed with shaking the mixture for at least a minute, then insert the enclosed filter. In case you are mixing smaller quantities of lacquer, then pour the required amount of lacquer into a separate can. 1 litre of lacquer corresponds to one part of hardener, 2 liters to 2 parts and so on. The resulting mixture has to be used within 4 hours. • Apply the lacquer using a Bona Roller. Roll with a smooth, flowing motion alternately across and with the grain of the wood, avoiding accumulations of the product. Always maintain a 'wet edge' to avoid overlaps. Before applying the following layers, you should let it dry properly. • If necessary, you can do an intermediate sanding using a screen, or the Bona Scrad System grit P150(or even finer one than that), then remove the dust before applying a final layer of lacquer. It has to be noted that if the previous layer of lacquer has been allowed more than 24 hours of drying time, then an intermediate sanding is always required. After the aforementioned treatment, floors will be able to take light floor traffic approximately 8 hours and may be put into full use after 12 hours. Allow the surface to dry for at least 3 days before covering with carpets or other floor coverings. After the aforementioned treatment, floors will be able to take light floor traffic approximately 8 hours and may be put into full use after 12 hours. Allow the surface to dry for at least 3 days before covering with carpets or other floor coverings. Also avoid placing heavy objects and avoid damp moping the floor during this time. 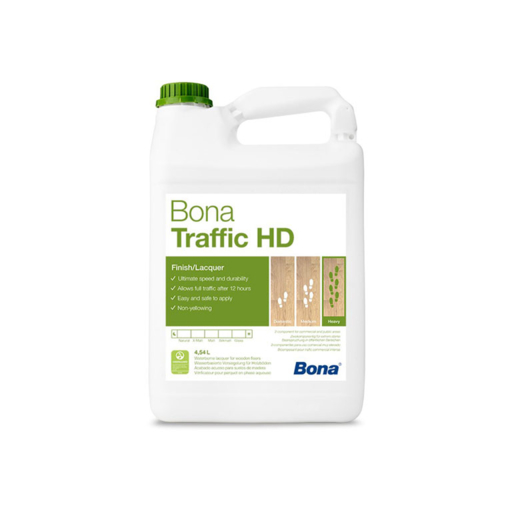 Another important note: if Traffic HD has been combined with Bona Prime Deep and Bona Create, then the surface must be allowed to cure for 1 week before covering the surface. NOTE: Traffic must be used with the Hardener. The Traffic/Hardener must be mixed by shaking it vigorously for one minute. If small quantities of product are to be mixed, the Traffic container must be shaken before decanting product from it. Once mixed, Traffic is viable for five hours. We offer Bona Traffic HD in Silk, Matt, ExtraMatt and Anti Slip Matt. A friend with more experience recommended it to us and we did not regret it. It doesn't smell much, and the men we hired to do the job said it was easy to apply. I am not a professional but looking at my floor now I tend to agree with them. Still looks great and proved to be resistant to heavy use. One of the best lacquers I have used - from application and durability view. A bit pricey - the only downside for me. Can be applied multiple times for one day as it dries fast and has almost no odour. People are always happy when I use it on their floors as a finish. Good quality comes with a price tag.